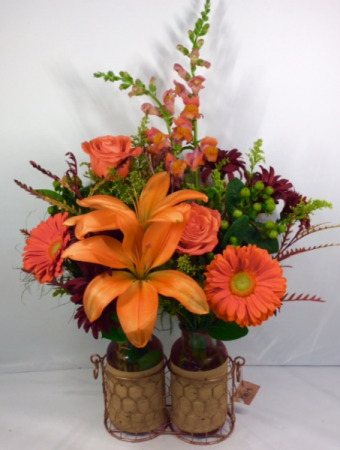 Send this vibrant fall arrangement and really dazzle the middle of a table or a desk at work! It has a wide variety of seasonal flowers like gerbera daisies, lilies, snapdragons, roses, mums and berries. It is arranged in 2 glass vases wrapped in wood grain ribbon and set in a wire holder. O Bowl With Candle, Red Seeded Euch, Red Rose, Red Carns, Pomps, All Fall Tones. Single candle round centerpiece. perfect for smaller sized tables. red rose, red carnations, burgundy, butterscotch and yellow chrysanthemums and seeded euch make this the rich colors of thanksgiving. 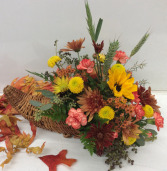 This exquisite cornucopia of fall flowers is perfect as a table centerpiece. 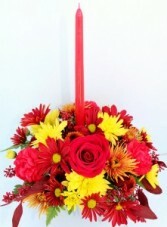 It is full of seasonal flowers like mini sunflowers, wheat, orange mini carnations, pomps and blue berries.